The worlds finest pepper - that's a pretty big statement to make, right? Can there really be such a thing as the worlds finest pepper? 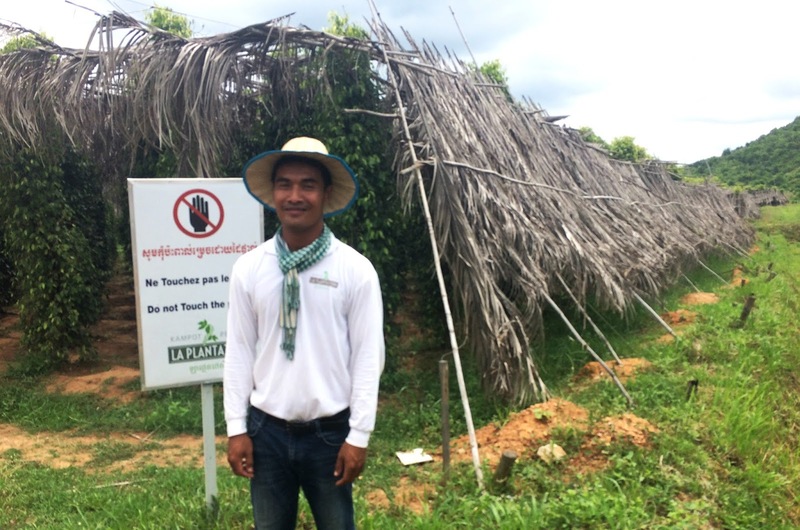 When in Kampot in south-west Cambodia a couple of months ago Lewis and I heard and read about La Plantation - an organic pepper farm in Kampot that claims to grow and produce the best pepper in the world. Naturally, we wanted to see what all the fuss was about. Lewis and I had met up with his dad, who was also travelling around South East Asia, in Kampot and we were planning on travelling to Kep together. Conveniently, La Plantation was located pretty much on the way to Kep so we shoved all of our bags into a tuk tuk and set off to taste the worlds finest pepper. The journey to the pepper farm was beautiful. We passed through dusty little villages where children played in the roads and locals sold fruits; we travelled through long stretches of rice fields and even stopped and had a peek at the salt fields. 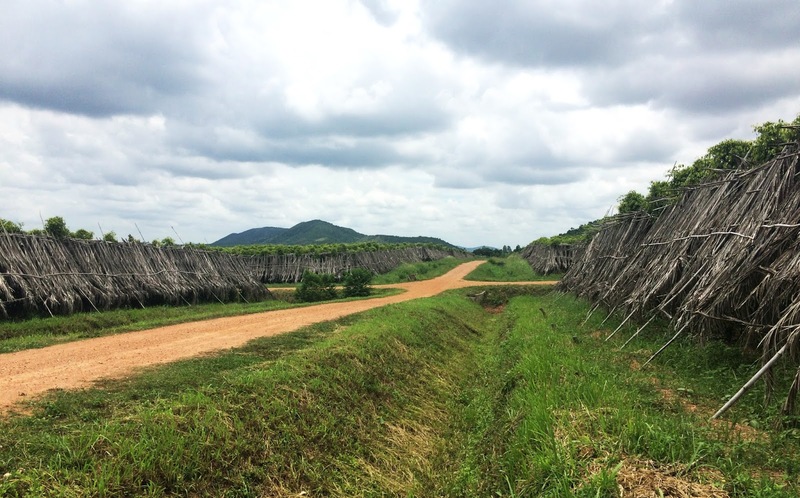 It turns out Kampot is almost as well known for its salt as it is its pepper. The bumpy roads and our heavy luggage meant that for the majority of the journey the tuk tuk was at an angle that I was sure I was going to fall out of, but after making Lewis and his dad, Justin, switch and swap seats and luggage a few times to restore the balance (much to their amusement) I felt comfortable. As we rounded a corner and drove down the dusty track to La Plantation we could see several plantations - all green, luscious and well maintained. The backdrop was beautiful: mountains and an overview of a 'secret' lake. We pulled up outside, got out of the tuk tuk into the hot and sticky air and we were directed to the big cafe/restaurant - a beautiful big open building that had a little shop at the back showcasing the pepper. The cafe itself was fairly expensive but the tour of the pepper farm was actually free so it worked well. After an ice cold mango drink under a fan (ahhhhh...) we began the tour, which started with our tour guide giving us information on the farm and the pepper grown there. We learnt that the plantation was founded and owned by Nathalie and Guy - a French and Belgian couple - who were exploring South East Asia when they spotted the land in Kon Sat, Kampot in 2013. They bought the land and got to work on the project of building a pepper farm, recruiting a team of farmers and workers along the way. 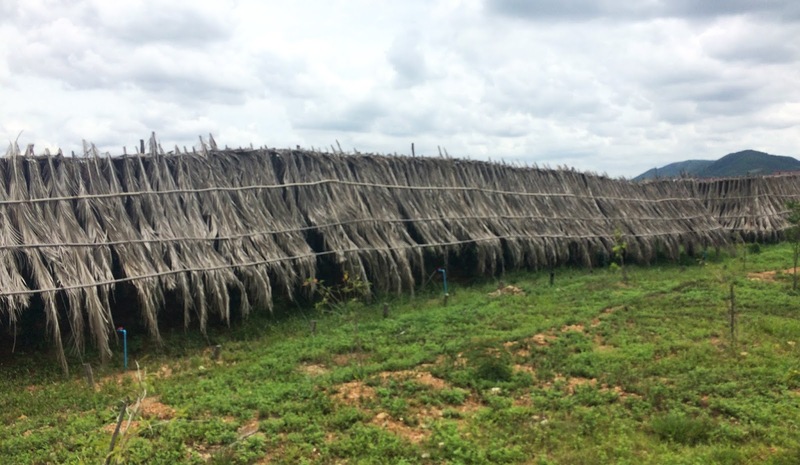 La Plantation now has 22,000 pepper posts spanning over a range of roughly 50 acres. Our guide talked us through the different types of pepper that they grow at the farm: green pepper, black pepper, red pepper and white pepper. He then passed around the different peppers for us to try. The black pepper is sharp and strong, the red pepper is less spicy and slightly more fruity and the white pepper is intense and herby. My pepper knowledge and experience doesn't really stretch too far so I feel like I'm not in a position to judge whether it is the 'worlds finest pepper', but I can tell you it was pretty good pepper. We also learnt that they grow wild turmeric and chilli on the farm. After that, it was time to walk around the farm and to see exactly how the pepper is grown. We were allowed into a plantation to see the pepper plants and our guide, who was very friendly, explained the process to us. 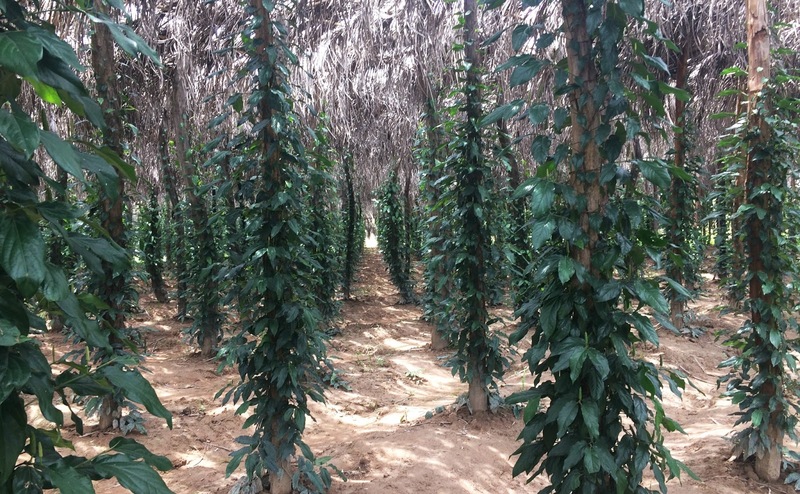 The pepper plants are grown and monitored carefully in long rows attached to tall wooden poles. In order to achieve the intense taste farmers regularly weed and hoe the plantations during different seasons. We learnt that the pepper is fertalised naturally with dried cow manure which our guide proudly let us smell (nice...) and that rainwater is collected to water the plants with. To avoid insects eating the plants, they have developed their own natural pesticide. 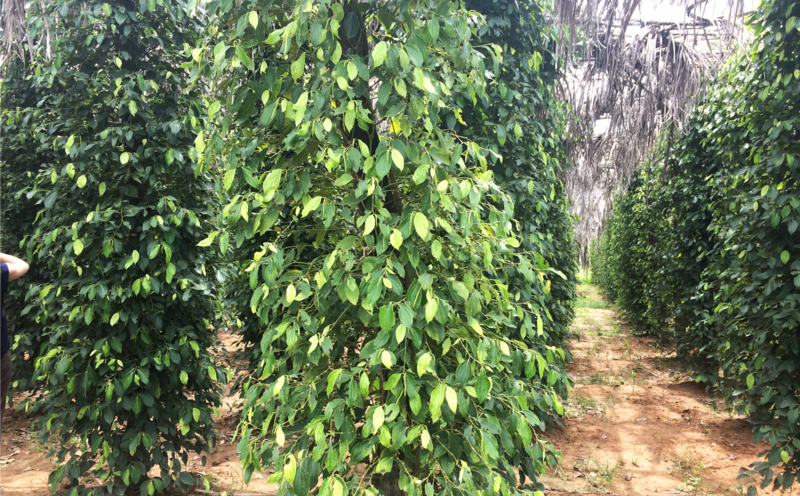 Once the pepper is ready and has reached maturity, the pepper is harvested and dried out. After our tour through the plantations we headed back to the restaurant where we had a look at the different products on offer - mostly bags of peppercorns, but they did spicy pepper rum too which I really wanted to try. Unfortunately we did have to get going (our tuk tuk driver waited patiently for us while we did the tour) so we headed back and all clambered into the tuk tuk to complete our journey to Kep. Should you visit La Plantation? If you are travelling around Cambodia, or even just visiting, I would recommend visiting La Plantation. It is very interesting to see the farm and to learn all about how the 'worlds finest pepper' - which is used by different chefs all around the world - is grown. The staff are friendly and welcoming and the tour is informative and interesting. If you are a fan of pepper, this is the place to visit! Looking to visit Cambodia? Read my post on Koh Rong - the island you HAVE to see. WOW what an absolutely amazing experience to get to try out. I would love to do something like visit La Plantation myself. Ooh I would to go here! This really does look like such a great experience, we really do love peppers! This looks so impressive! I never thought about what a pepper farm would look like but now I definitely want to visit one! Maybe I should get myself to Cambodia next year! What an experience and I always find it fascinating to see where things come from! 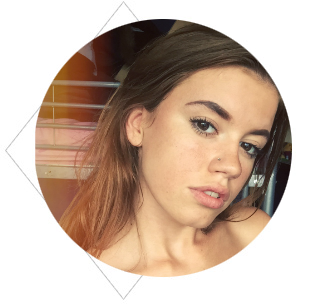 It sounds like you had an amazing experience! I would love to visit the world's finest pepper plantation and learn about why chefs all over the planet are appreciating them. It's over ten years since I visited Cambodia so the pepper plantation wasn't there then. Looks great though. What a great tour! We love peppers in this household and would love to visit an organic pepper farm! It's fascinating how they grown them! What a great experience! Love holidays, heard that there is a lot of culture in Cambodia too. Glad you had a good time. La Plantation seems like a really nice place to visit. If I am around Cambodia one day I will make it a priority. Oh, wow! This sounds like an absolutely amazing experience :) I'd love the chance to visit Cambodia.